We Need The Eggs: How Should We Talk About Ferguson? I don't enjoy being controversial. I used to enjoy it enormously. I used to like to make bombastic and over the top declarations, because I thought they were conversation/argument stimulants. I was a perfect creation of political talk radio. I don't think that way anymore. I like to spend time thinking, keeping an open mind, and considering things. I like to leave the door open on an idea or person for as long as possible. And one reason I write this blog is to invite people to take that thought journey with me. I have decided that the best place to begin with people who don't think like you is common ground. This may not be true, but this is where I am at right now. I have this belief that if you want people to listen to you, you should be nice to them. With regard to the picture above: Talk like this is a conversation ender, not a conversation starter. This is a variation of the statement "black lives matter" that has found its way onto many signs in many Ferguson protests in many cities across America, and the world. How can you respond to that? The only people who truly don't care about black lives are unreconstructed inveterate racist reprobates who are only liked and respected by their friends and family who think like them. They are a very tiny portion of the population, and they have little to no influence outside of their toxic circle. They are usually ugly, smell bad, have less teeth than should be expected, and we all know very few, if any of them. The rest of the country, which is the overwhelming majority of the country, care, to varying degrees of commitment, for the black community, as well as the rest of the colors of communities, while they're at it. Because the community of racist-to-their-core reprobates is so tiny, it is ok to say that basically everyone cares about the general well-being and flourishing of all other lives in this country. How do I measure this? This is how I define "caring" at its most basic level: If you could, at no risk to yourself, pull a drowning person out of a river, you would do it. And it would make no difference to you what color their skin was. You would do it. That means you care if that person lives or dies. But it all changes from there. The more risk, cost and effort it requires of you reveals your level of care. This is a moral and ethical calculation that every human performs, and there is nothing inherently wrong with it. For instance, I choose to spend the bulk of my time, money and effort on feeding my own children and seeing to their flourishing, and not flying to the other side of the world, leaving my own children, for the most part, hungry, and feeding strangers, instead. 99.9 percent of people would agree with my moral/ethical calculus, but isn't there something a touch barbaric in NOT devoting every waking moment to ensuring that all life lives, and then flourishes? But that's for another post. Unfortunately we are finite. Unfortunately we do not contain the ability to give adequate care to every thing and every person who requires it. What am I saying? I am saying that we do all care about black lives, we all get the golden star on our sheet. 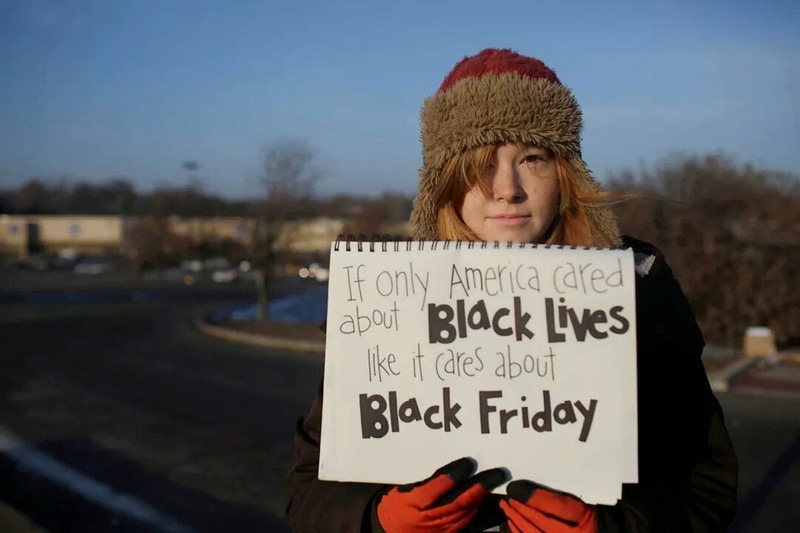 But the protesters are saying that most of us need to care a little more than we do, and they are probably right. I personally wish they were nicer about it. I think talk like this puts reconciliation farther away. But that's just a matter of taste, as we all know there is more than one way to skin a cat. Or fix a broken political/social system. But to what extent are we supposed to "care more"? What does it looks like to "care more"? It's incredibly complicated, and there is not a right answer. And the answer is different for everyone. And there isn't just one problem. There's a lot of problems. And there are probably even problems that we haven't been able to even articulate. There are problems in the white community, and there are problems in the black community. We don't all have an equal share in these problems, and we don't all have an equal share in their solutions. So what the f--- is it that we are supposed to do? I don't know. But talking about it probably helps. And being nice about it probably helps, even more. But even that is not a hard and fast rule. Sometimes people just need to get their anger out. If you can be nice, and hang in there with them through that, maybe they can get to what they actually think, now that they have that out of the way.